Serve up a classic combo with our Peaches 'n Cream JIGGLERS. Peaches 'n Cream JIGGLERS may just jiggle their way into being your new favorite treat. Add 1/2 cup boiling water to unflavored gelatine in medium bowl; stir until completely dissolved. Stir in milk. Pour into 8-inch square dish sprayed with cooking spray. Refrigerate 25 to 30 min. or until set but not firm. Meanwhile, add remaining boiling water to peach gelatin mixes in separate medium bowl; stir 2 min. until completely dissolved. Stir in cold water. Cool until ready to use. Pour peach gelatin slowly over gelatine layer in dish. Refrigerate 2 hours or until firm before cutting into 36 squares. 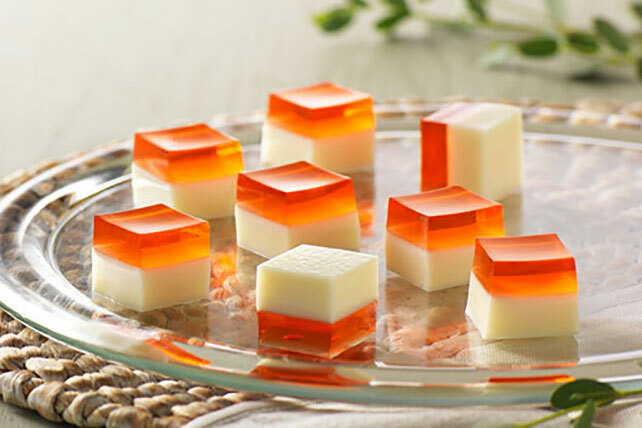 Instead of cutting the gelatin into squares, use cookie cutters to cut it into desired shapes.